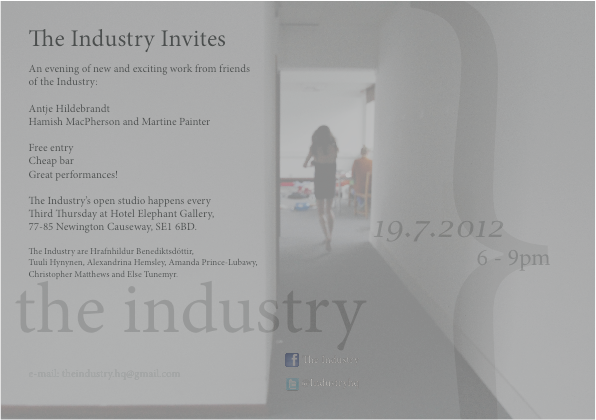 The Industry is a group of 6 performance makers whose paths crossed in an exhibition earlier this century. They now come together to be productive in creativity and have found a home at Hotel Elephant, an independent gallery in South London. The industry are Hrafnhildur Benediktsdóttir, Tuuli Hynynen, Alexandrina Hemsley, Amanda Prince-Lubawy, Christopher Matthews and Else Tunemyr. This entry was posted in Meeting Place, Performance by Martine Painter. Bookmark the permalink.